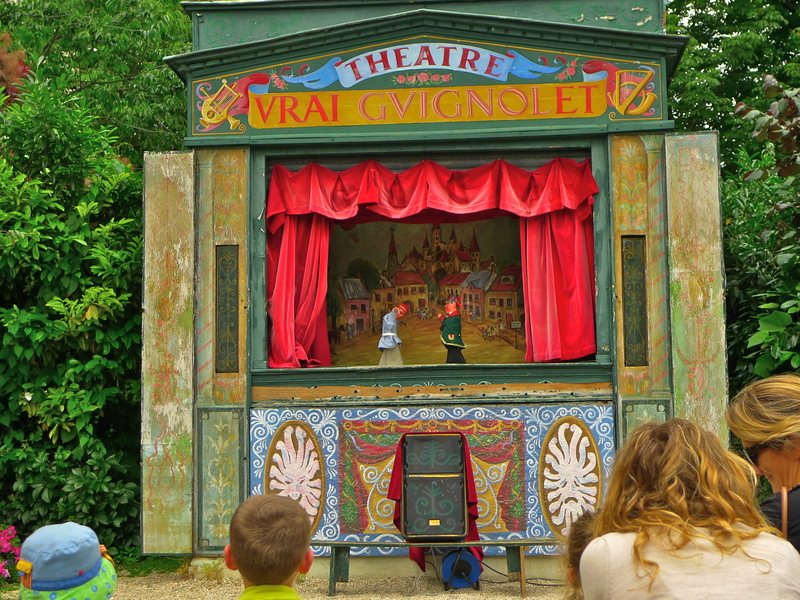 NESTLING BEHIND A CLUSTER of trees behind the théâtre Marigny and close to the Rond-point des Champs Elysées, the puppet show, Les Marionnettes des Champs Elysées, is simply entrancing. 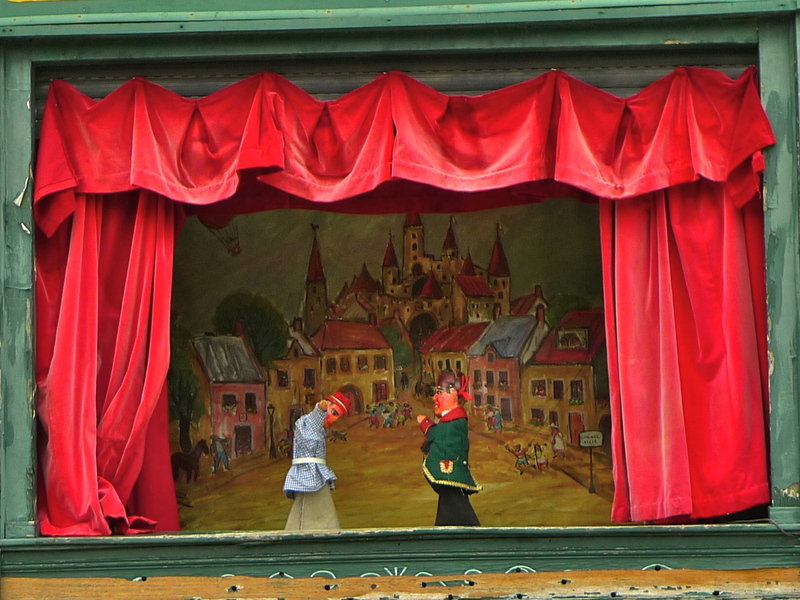 This puppet theatre has been here since 1818 making it the oldest marionette theatre in Paris. For generations it was owned by the Guentleur family but in 1979 it was acquired by José-Luis Gonzalez who has kept it going in the original tradition, a tradition dating back to the beginning of the 19th century. 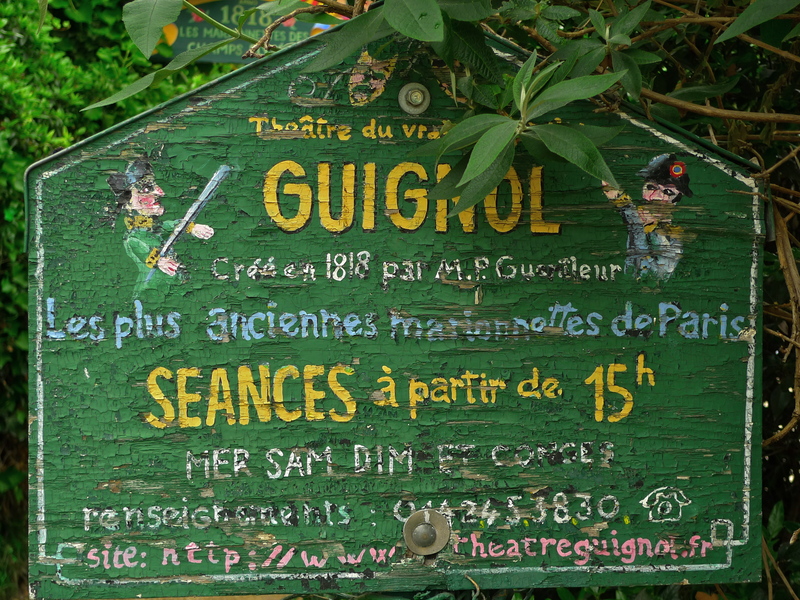 Guignol is the most popular puppet character in France and his name has become synonymous with puppet theatre. He was created in Lyon at the very end of the 18th century by Laurent Mourguet, one time silk weaver, peddler and later a dentist. Dentistry in the late 18th century was a primitive art consisting entirely of pulling teeth for free and making money by selling potions afterwards to kill the pain. Mourguet had the idea of attracting customers by setting up a puppet show in front of his dentist’s chair. Mourguet’s first puppet shows were based on the Italian commedia dell’arte and featured Puncinella, or Punch as he’s known in England. By the turn of the century Mourguet’s shows were becoming so successful that he gave up dentistry and became a full-time puppeteer. His puppet shows took a satirical look at the concerns of his working-class audience and included references to the news of the day. This proved to be a highly successful formula which lives on today with TV shows like Spitting Image in the UK and Les Guignols de l’info in France. Mourguet developed characters close to the daily lives of his Lyon audience, first Gnafron, a wine-loving cobbler, and in 1808 Guignol. Other characters, including Guignol’s wife Madelon and the gendarme Flagéolet soon followed, but these are never much more than foils for the two heroes. 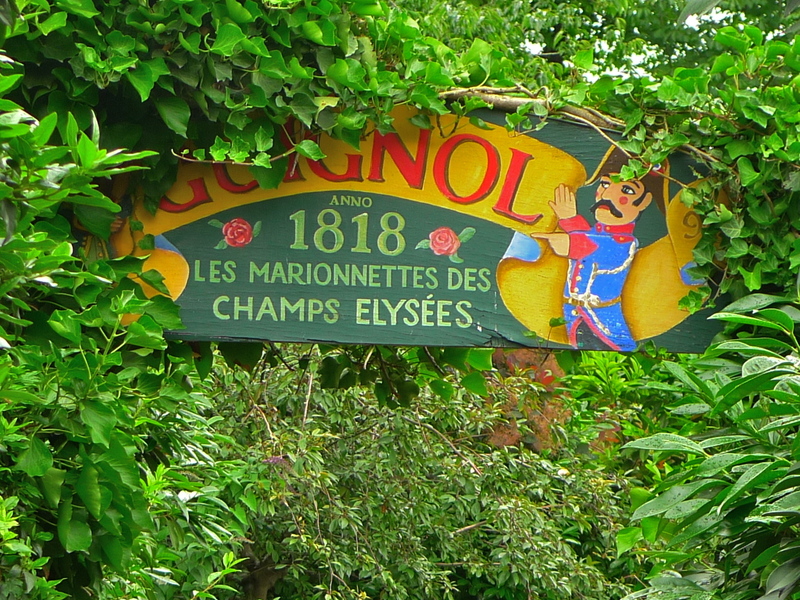 Guignol was supposedly named after an actual Lyonnais silk worker and he was originally performed with a regional dialect and the traditional garb of a peasant. 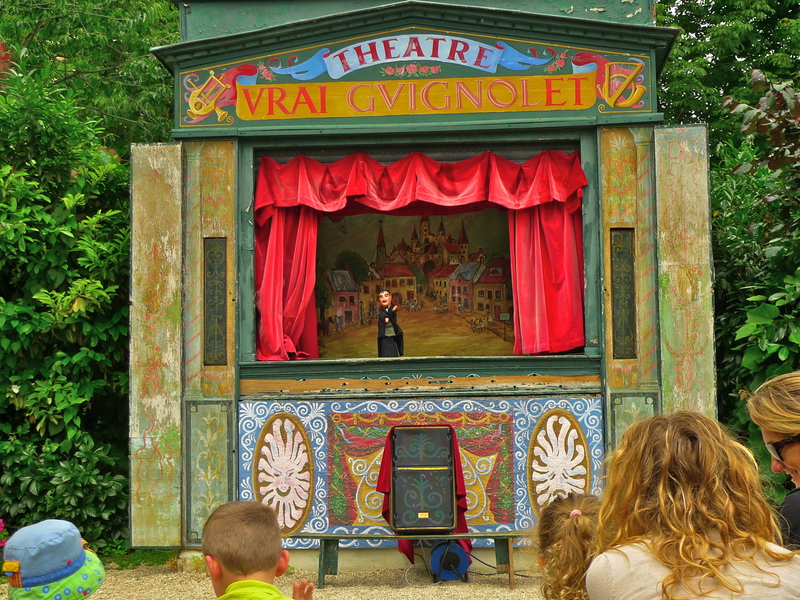 Guignol and the puppet shows that feature him are very much a Lyonnais tradition. 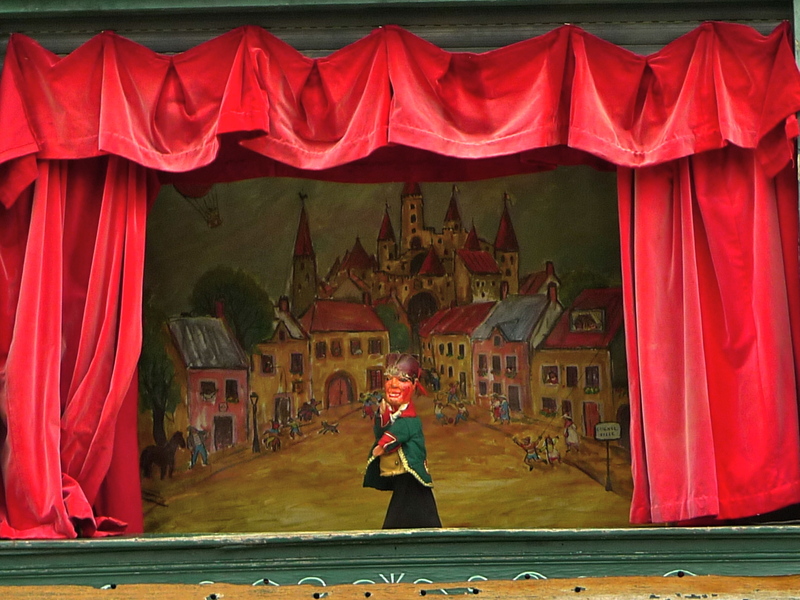 In Paris, les Marionnettes des Champs Elysées departs from that tradition slightly in that Guignol wears a green coat with red facings whereas in Lyon he wears brown. Also the name of the theatre, Théâtre Vrai Guignolet, is different. This is because, according the current owner, Guignolet is for him the real Guignol of Paris as opposed to the Guignol of Lyon. This sound piece is an edited version of the full Marionnettes des Champs Elysées show that I recorded but you will still hear a man dressed in black sporting a moustache opening and closing the curtains, Guignol, his wife and son, a misbehaved mouse and, of course, the inevitable gendarme, Flagéolet. 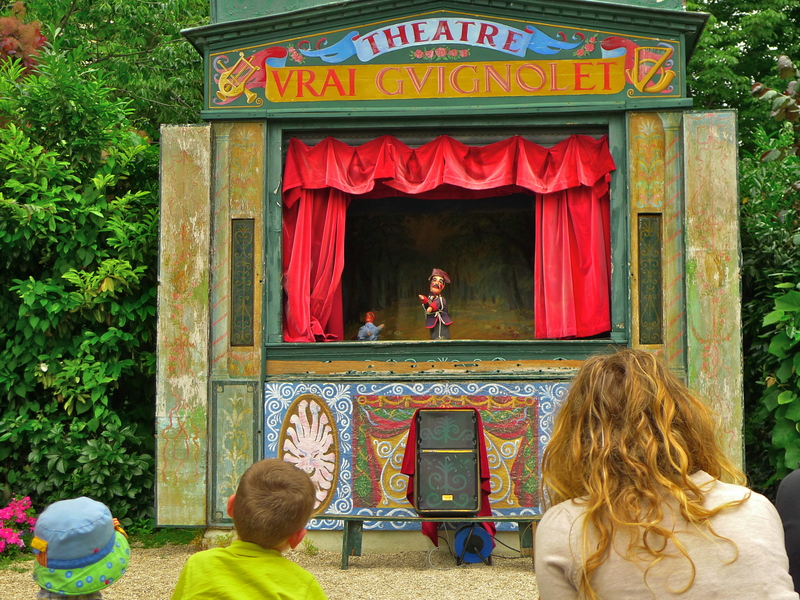 These puppet shows are often thought of as just children’s entertainment – Les Marionnettes des Champs Elysées is advertised as being suitable for children from 3 to 10 years of age – but they are much more than that. In Lyon they say that, “Guignol amuses children… and witty adults.” Guignol’s sharp wit and linguistic verve have always been appreciated by adults as well as children. It’s over fifty years since I last went to a puppet show and that was a very English Punch & Judy show. When I went to see Les Marionnettes des Champs Elysées I was just as excited as I was all those years ago and I probably laughed even more now than I did then. Whether you are young or old or whether you speak French or not, I hope you will get as much pleasure from listening to Les Marionnettes des Champs Elysées as I do. Guignol’s wife in particular trying to catch the mouse with cries of, “Arrête … Arrête”, reduces me to fits of laughter every time I hear it. I enjoyed hearing the children grow more exasperated each time they were “misunderstood” — but I *loved* hearing their laughter, even as the klaxons honked and brakes screeched in the background. What a magical, sweet, droll recording. Thank you for brightening my day! Thanks Heather. I had a lot of fun recording this. The enthusiasm of the puppeteers and of the children was infectious. It was €4 very well spent!